On the way back from Sioux Falls, the weather once again played a factor in my route. I needed to leave SD before the storms arrived and I was also hoping to hit one more state on the way. 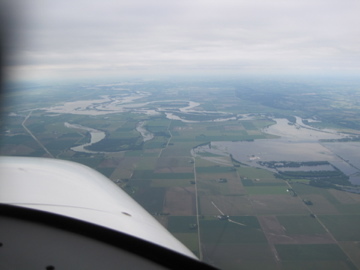 Omaha, which is right on the Missouri River near the Iowa border, was also affected by the floods. 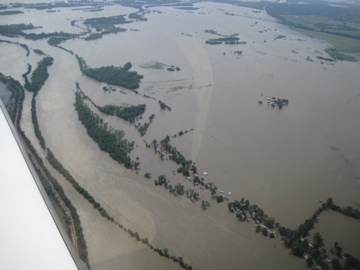 The airport was still open despite flooded areas adjacent to several taxiways. After landing, I jumped into a crew car and headed to the Hollywood Diner. It was simple, regular diner food. But it did have some unusual decor. The whole place is decorated like a 1950s diner with tinsel town memorabilia in every wall, ceiling and corner. The final leg of the journey was from Omaha to Lexington. This part of the journey was smooth and uneventful. Even had a moderate tailwind most of the way. Angel Flight "on the way home"